Ronnie Hilton seems to be almost forgotten by today's music industry but he was one of Britain's most popular singers of the 1950s. He started singing professionally under his adopted name during 1954 after leaving his safe job in a Leeds engineering factory. A true Yorkshireman, Ronnie Hilton always remained loyal to his roots- especially to Leeds United. He has composed, sung and recorded several anthems as tribute to the football club he loved. 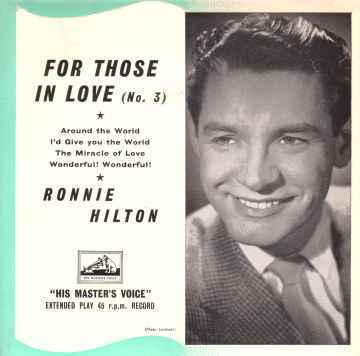 Ronnie's greatest hit was 'No Other Love' a song which he sang at the height of his successful recording career. It was an enormous smash in Britain, but he never had any luck in the United States. He will also be remembered well for his very last chart entry in 1965 which took him away from the romantic ballads of his earlier years- 'Windmill In Old Amsterdam'. This song has been a favourite with children of all ages for very many years. The EP on the left (HMV 7EG8270) was one of a series introduced during the late 1950s bearing titles which capitalised on Ronnie Hilton's reputation as a romantic balladeer. The sleeve notes claimed that his voice had a charm that 'floods teenage hearts with emotion'. Although that's probably putting things a bit too strongly, Ronnie Hilton certainly still held massive appeal for his slightly older female audiences at the time of this record's release. Towards the end of his career he made only infrequent UK television appearances, but he was often on BBC radio programmes as a DJ where his experience and encylopedic knowledge of the music and performers of the 1950s were put to great effect. Some Of Ronnie Hilton's Earliest Recordings were issued only on 78rpm and do not appear here. HMV 7EG8121 1956 "The Star Of Song"
HMV 7EG8149 1956 "Hey There"
HMV 7EG8198 1957 "For Those In Love"
HMV 7EG8202 1957 "For Those In Love No.2"
No Other Love/A Woman In Love/Constant And True/Who Are We? HMV 7EG8270 1958 "For Those In Love No.3"
Around The World/I'd Give You The World/The Miracle Of Love/Wonderful! Wonderful! HMV 7EG8375 1959 "A Song For You" w.Frank Cordell Orch. HMV 7EG8446 1959 "Ronnie Hilton's Hit Parade"
The World Outside/The Day The Rains Came/Gigi/I Love You! HMV 7EG8502 (GES5775) 1959 "Christmas Greetings"